The Hiblow HP-100LL can be used to aerate ponds up to 1 acre in size and up to 8 feet deep. The Hiblow linear air pumps offer very quiet operation and are extremely energy efficient when compared with other pond aeration compressors. The Hiblow linear air pump is by far the best option for small sized / shallow depth ponds. 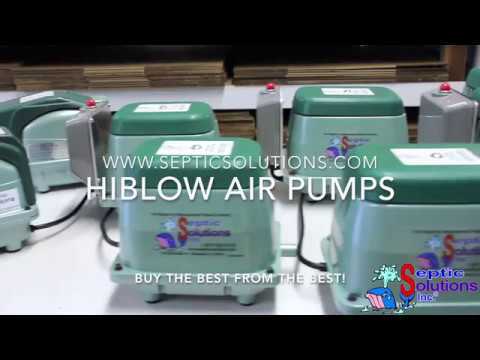 Below are some frequently asked questions about the Hiblow HP-100LL linear air pump. If you have further questions, call our customer support staff toll free at 1-877-925-5132 or email sales@septicsolutions.com! What is the difference between the Hiblow HP-100 and the Hiblow HP-100LL? The new Hiblow HP-100LL is an improved long life version of the Hiblow HP-100. The original Hiblow HP-100 would average around 2-3 years of diaphragm life. This new and improved Long Life version should see around 5 years out of diaphragms. Can the Hiblow HP-100LL be left out in the weather or does it need a weatherproof cover? The Hiblow HP-100LL is considered weatherproof and can be installed without a cover. However we highly recommend using an air pump housing to further protect the unit from the elements. Click here to view the air pump housing options. Does the Hiblow HP-100LL come with the fitting to connect to my alarm or control box? Yes. The Hiblow HP-100LL comes with an optional brass barb fitting that will allow you to connect a 1/8'' airline from the air pump to your alarm or control box. Does the Hiblow HP-100LL come with a manufacturer's warranty? Yes. The Hiblow HP-100LL comes with a standard manufacturer's warranty of 1 year. What size airline should I use with the Hiblow HP-100LL? The Hiblow HP-100LL air pump is designed to be used with 3/8'' ID airline or larger. It comes with a rubber 90 coupling connector and hose clamps. Refurbished vs New? Which one is the better choice? In this instance, the new LL version will be the better choice. Our refurbished units will be the older version which will have a significantly less life than the new and improved LL version.